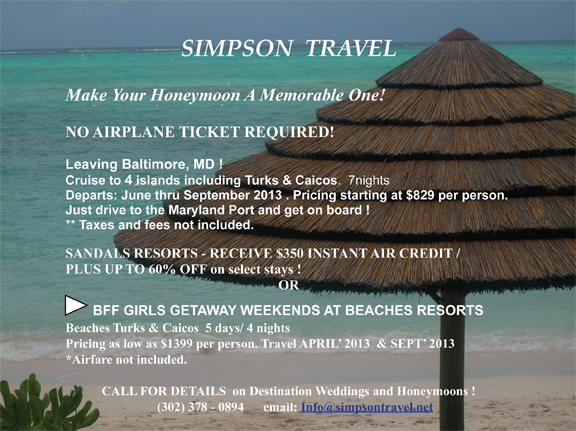 Simpson Travel, LLC will customize your honeymoon or vacation while offering competitive rates and personal attention. We realize that wedding planning can be quite stressful and time consuming. We feel that planning a honeymoon should not be. Whether your dream honeymoon package consists of an all inclusive resort, a luxury cruise, a private beach getaway, or anything in between, Simpson Travel can put together a honeymoon package tailored just for you. Our process includes researching your destination(s), researching pricing, making sure a honeymoon package is available, finding the best flights, and much more. With all our traveling together, my husband and I have never used a travel agency. Preparing to plan ourhoneymoon, together we’ve decided to use a travel agency because it was for a special occasion and we used Simpson Travel, which was a referral from our parents. It was the best decision we’ve made! Our agent was Crystal, and we were taken care of extremely well. All of the location options she recommended to us madeit hard to decide. Finally we decided on the resort, Royal in Cancun. It was AMAZING! The staff was magnificent and made us feel like royalty. 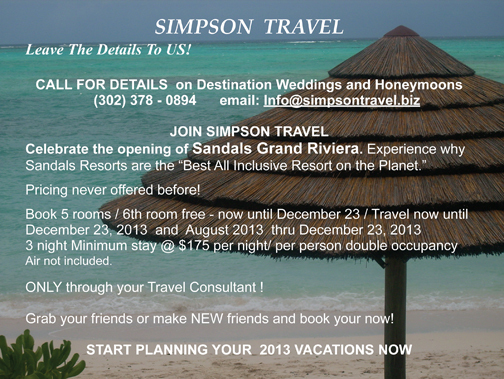 We are looking forward to using Simpson Travel again for future travel. ~ R & J Smith.